I have to admit I know next to nothing about the homebrew community on the DS. I knew it existed, but considering the current state of emulation on and for Nintendo's portable system, I haven't paid it much attention. Apparently I've missed out on a few gems--including a cute little game called Everlasting Love. Based on descriptions I've read elsewhere, the game seems to be an odd but compelling mix of platforming and rhythm-based action. 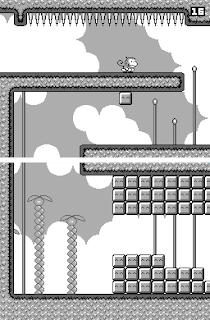 Players are tasked with moving a jittery, jumping monkey from the start of each level to its end. That's not as easy as it sounds, however, as the closer your monkey's jumps are to the beat of the music, the higher her jumps are. That can be a problem when spikes aren't far from her furry little head. Two levels currently are available on line. I'm not exactly sure how you're supposed to get them to work, though I'm sure a little Google action will help if you're interested.